A new exhibit on Olvera Street ties past to present. Immigration, health care, civil rights, voting rights, jobs and war, all hot button issues today and the focus of a new exhibition exploring the legacy of Edward R. Roybal, a former Los Angeles councilman and congressman who first started working on these same issues in the 1940’s. Presented by the Lucille and Edward R. Roybal Foundation and El Pueblo de Los Angeles, “Roybal: Man of the People,” opened Jan. 6 and runs through Jan. 30 at El Tranquilo Gallery on Olvera Street. An opening reception with the artists will take place on Saturday, Jan. 14 from 5p.m. to 9 p.m., and admission is free. “The exhibition is a tribute to Congressman Roybal’s legacy, but from the unique perspective of what’s happening today,” the show’s co-curator Jimmy O’Balles told EGP. An outstanding mix of artists are taking part in the mixed-media show and according to O’Balles, their works interpret the civil rights issues Roybal dedicated his life to in contemporary themes rooted in decades of struggle. “With everything going on with [President-elect] Trump, we can see that the struggles are the same,” he told EGP. “Roybal: Man of the People” includes works by more than two dozen artists, including many well-known and respected artists such as John Valadez, Margaret Garcia, Joe Bravo, David Botello, Ignacio Gomez, Wayne Healy, Leo Limon, Oscar Castillo, Jose Antonio Aguirre and J. Michael Walker to name a few. 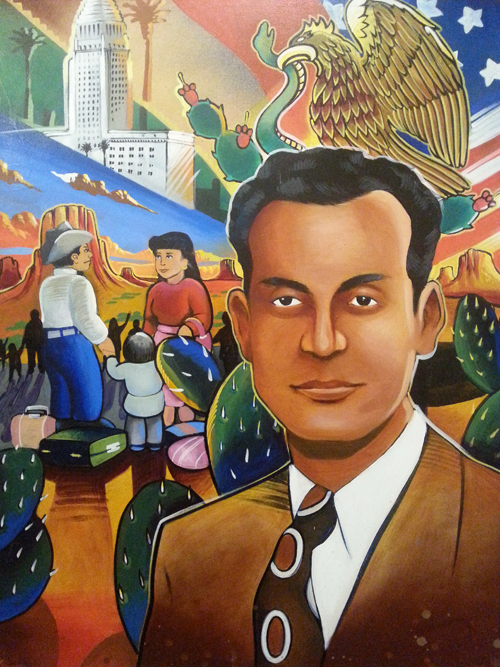 Many of the works have a definite reference to Los Angeles politics, including images reflecting and highlighting Roybal’s time on the city council and years as a member of Congress representing East Los Angeles and Boyle Heights and other predominately Mexican American communities on the eastside. O’Balles says it’s important for the community to know that there is deep history in the movement and about the people, like Roybal, who dedicated their lives to many of the same issues still confronting us today. Roybal was “the nation’s champion for public health and social justice … [and] the first Mexican-American politician from East Los Angeles to attain national recognition,” writes Elsa S. Greno in her essay “Edward R. Roybal’s Legacy for Latinos in the United States” that is being circulated as part of the outreach campaign to promote the exhibition. He graduated from Roosevelt High School in Boyle Heights in 1934, studied business at UCLA and law at Southwestern University and served in the Army during World War II. He was elected to the Los Angeles City Council in 1949, becoming the first Latino to serve on the council in the 20th Century. He held the position for 13 years: another Latino would not serve on the council until 1985. He would help create the Community Service Organization (CSO) and the Mexican American Political Association (MAPA), two groups that registered more than 145,000 Latinos to vote and worked diligently to give them a voice on issues at home and in the nation’s capitol. Roybal was elected to the Congress in 1962, making history again by becoming the first Latino in the 20th Century to represent California in Washington D.C. He would go on to serve 30 years in congress, becoming a nationally known advocate on bilingual education and bilingual court proceedings, defunding the war in Viet Nam, healthcare for veterans, including Mexican Americans in the Voting Rights Act, outlawing age discrimination, challenging the unfair and unequal treatment of Latinos in immigration and naturalization laws, funding for programs to help elderly and poor Hispanics, changes to the 1980 Census to b more responsive to Latinos and the introduction of National Hispanic Heritage Week, among many other issues of importance. At a press conference Wednesday, President-elect Trump restated his commitment to building a wall to secure the U.S.-Mexico border and stop people from entering the U.S. illegally. A piece in the Roybal exhibit by Jose Antonio Aguirre titled “No Comments: Siempre LoMismo,” stands as a strong statement in response to what many call the hardline and militarized enforcement of the border: a family running with guns pointed at the target on their backs. O’Balles told EGP that many of the pieces are for sale but prospective buyers will have to wait until after the show to make the purchase because El Pueblo does not allow items to be sold at the city-operate venue. However, purchases can be made through the nonprofit Roybal Foundation, which will receive 40 percent of the proceeds to support its local programs. El Tranquilo Gallery is located at 634 N. Main St. in downtown Los Angeles. (Entrance located at W-19A on Olvera Street). The exhibition is open daily during regular gallery hours. For more information, visit El Pueblo’s Facebook page. January 12, 2017 Copyright © 2012 Eastern Group Publications, Inc.